Ed Harris – at the OB Veterans Plaza event, Nov. 11, 2014. 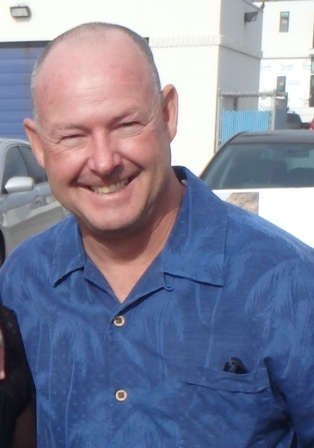 Another big name has entered the San Diego mayoral contest – Ed Harris – who represented Ocean Beach and Point Loma and the rest of District 2 for most of 2014 as an interim councilman – is in the race. Harris – a Democrat – announced Tuesday he’s throwing his hat in the ring (any other analogies out there?). Besides sitting on the City Council, Harris has been the head of the city’s lifeguards union. Harris has been a strong advocate for getting better health care for lifeguards, and has been alerting the City to a looming lifeguard shortage, as many experienced people are retiring over the next 2 years. 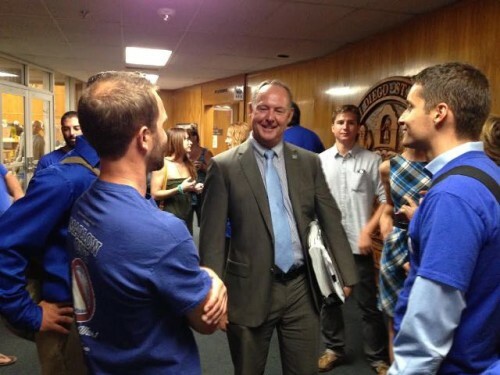 While on the City Council, he continued his support for labor issues, as well as community issues. He took issue with the City contracts with businesses leasing Belmont Park, popularizing the view that the City wasn’t getting enough out of the deal. His efforts were overturned later by Councilwoman Lorie Zapf, who won the seat in the primary. Ed Harris in center – the day the City Council voted to approve the OB Community Plan. He did make a lot of friends within District 2 – and has hopes it appears that he has enough of a base at the beaches to give Kevin Faulconer a serious run for his money. Doug Porter, today, has illuminated some serious breaches within the local County Democratic Party’s support for Harris in the past. But with his prominent standing in the labor element of city politics, Harris can probably count on labor support for his candidacy and helping him immensely in his ground game against the current mayor. Former state assemblywoman Lori Saldana, of course, is the other big name in the race. She is running as an independent, and is a former Democrat – burned by the local Party. With both Saldana and Harris, it seems less likely that Faulconer can walk away with the election at the Primary stage – as he and all the Republican establishment types have been believing – up to yesterday. Progressives have been calling for months for the Dems to field a major-name against Faulconer. The OB Rag – for instance – has been pestering Harris on whether he was going to run for the office. Those dreams of having a Democratic mayor and the GOP nightmares of having none have now taken hold. California local elections are non-partisan… So I’m kinda disappointed when I read an article and the first thing mentioned is what their label is. Sure, but it’s kind of naive to think that the parties don’t play a role – especially here in San Diego – where the Republicans dominated local politics for so long. Kind of naive?! You’re sounding mellow today, Frank. Yes, “play a role” is an understatement… D or R is 95% of it. But wouldn’t that make you feel warm and fuzzy if someone read partway through article on a candidate, and formed an opinion of them, before seeing what their label is? Now this is some good news! Please post his website once up so supporters can donate money and/or time! Having both Saldana and Harris in the race will waste resources and split the opposition to the Mayor. By the way, the Dem’s must really hate Saldana for some reason. I agree with RB. I like both Saldana and Harris and both would be far preferable to Faulconer. But, if they both run, what RB said could come to pass. I think they should both watch the polls and see if they can sense who would fare better against Faulconer and unite behind one person. Not so fast. Faulconer has to get >50% of the vote to avoid a runoff. The democratic candidates are fine splitting votes as long as they don’t shred each other and completely alienate each others’ voters. Last time around Demaio won the plurality in the primary, but Filner picked up votes from the 3rd, 4th, etc candidates and won the run off. Open primaries are a wonderful thing, it gives moderate candidates a chance. The fact that Lori and Ed are both running for Mayor will ignite disillusioned, dispirited Dems, lonely Independents and lost Decline-to-States. It makes this an interesting and exciting race now, with potential for real conversation about City issues, not just how to keep the Chargers. Many San Diegans have concerns and issues that our Mayor has ignored. Lori and Ed will address Kevin’s failures from different angles, with occasional intersection. Their supporters are philosophically different. They are very appealing candidates and represent the best of what Dems stand for. I am grateful to both for stepping into the fray. Older Article: Poll: Do you think there is now more or less airplane noise in OB or Point Loma?